Sometimes life can feel like an uphill climb, in the rain, in knee deep mud. Maybe it feels like you can never catch a break and everywhere you turn, something more challenging occurs. Maybe you feel like your emotions dictate your life and you’re exhausted and ready to give up. If any of this sounds familiar, keep reading to find out if DBT could help you change your life. Do you ever feel like your whole day or week is spent fighting with others, crying, and feeling overwhelmed? Or maybe it takes you a long time to come down from emotional reactions? DBT can help! DBT focuses on teaching skills to help you manage your emotions, effectively handle conflict, and learn to tolerate difficult emotions. Maybe it’s hard for you to connect with or trust other people in your life, you notice that you are frequently not getting what you want out of relationships, or it’s difficult for you to get along with friends and family. DBT can help you learn effective skills to get your needs met, feel good about yourself in interactions, and maintain healthy relationships. Are you actively self-harming or thinking about self-harm? Have you attempted suicide or you are thinking about suicide? We all deserve to have a life that’s worth living, and A DBT therapist can work with you to manage these urges and help you find different, more effective long-term solutions so that you can find your life worth living. Perhaps you’ve tried different therapists, different medications, and nothing seems to work for you. DBT is a research supported therapy that works well with treatment resistant symptoms such as depression and anxiety. 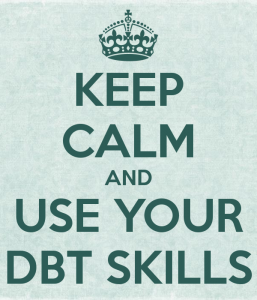 DBT is an effective therapy for adults and adolescents because it helps individuals learn healthy coping skills to manage emotions, tolerate distress, maintain relationships, and practice mindfulness regardless of your stage of life. DBT is a research supported, protocol driven therapy used to help individuals struggling with a variety of issues. At the Summit, we have a team of 5 intensively trained DBT therapists ready to help adults and adolescents create more fulfilling lives. Our DBT program combines individual appointments and group skills classes to create the most effective results for you or your loved one. Call us today at 678-893-5300 or visit our website www.summitcounseling.org to schedule a DBT assessment!